Find the Perfect Door for Your Entryway! 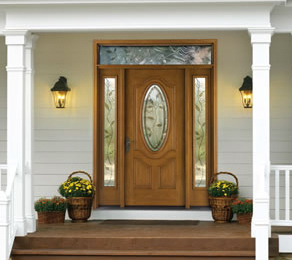 Your entryway is one of the focal points of the outside of your house. 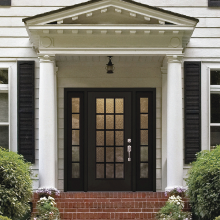 We know you want your entry door looking perfect for when guests arrive, which is why we offer beautiful and functional options for your Connecticut home. Window World of Connecticut is your resource for strong, insulated and well-crafted replacement doors. See what we mean by browsing our options below. Window World’s top-of-the-line product, the Classic-Craft family of doors, are available with premium hard wood-graining brought to life by our patented technology, or with a smooth surface for a more contemporary look. Crafted with solid wood edges and embossment details, these doors boast more than 26”-wide center panels. 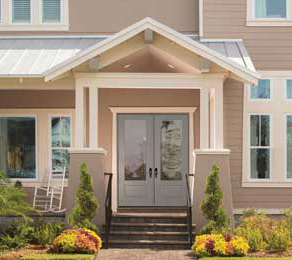 Many options are available to you with the five unique collections that come with the Classic Craft Door System. This line features two beautiful collections – Oak and Mahogany. Whatever your style, this option is both functional and detailed. Deep, wood-grained detailing gives these doors a unique look that is sure to add character to your entryway. Delivered in a sleek, paintable package, these options are the more attractive, durable alternative to steel. 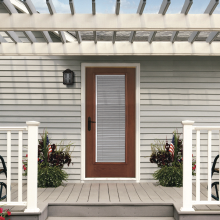 Made ready-to-paint, the Smooth-Star Door System is more durable than steel, and resist dents, dings and rust. Looking to minimize your energy costs? 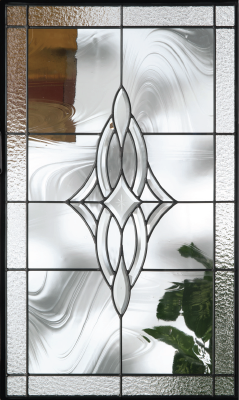 Factory-coated clear Low-E glass keeps your home cool and comfortable no matter the season. It can be fitted with a variety of divided lite options or cordless interval blinds to personalize the look of your entryway. Thermally-sealed and easy to clean, grids between glass (GBGs) are made to be customized. Whatever option you’re trying to complement, these choices are sure to enhance your entryway. 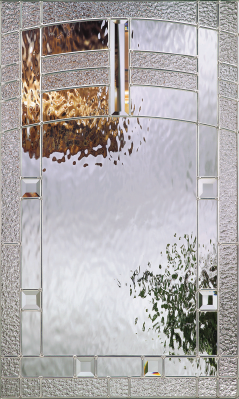 Water glass, clear bevels, granite glass and brushed nickel or black nickel caming. 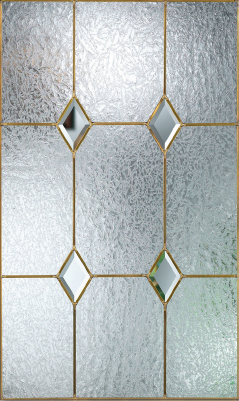 Clear baroque, water and granite glass, clear bevels, and black nickel, brushed nickel or brass caming. Glue chip glass, clear bevels and brass caming. *Colors not available in aluminum cladding. Colors shown here may vary from an actual application due to fluctuations with screen color display settings. See your representative for actual color samples. 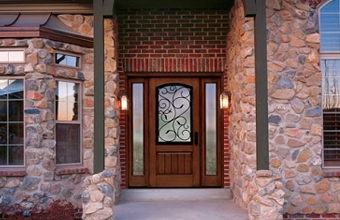 What Makes Our Entry Doors Special? 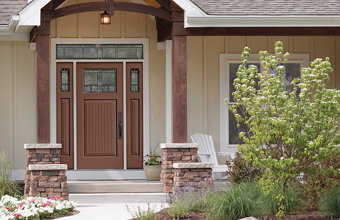 Here at Window World of Connecticut, we know our replacement entry doors stand strong above the rest. Not only are they attractive, but they also offer security and protection against the elements. Composite Adjustable Sill – Moisture doesn’t stand a chance with the air-tight seal on the inswing applications. Ball-Bearing Hinges – Each hinge pivot, or “knuckle,” provides more support, stability and smoother performance. Dual-Bulb Bottom – Dual-bulb design on inswing systems works with weatherstrip and corner seal pad to help prevent moisture and air infiltration. Foam-Filled Compression Weatherstrip – Weatherstrip remains flexible and helps insulate against the outside elements. Rot-Resistant Brickmould & Jambs – Made of durable rot-resistant material that helps prevent insect and moisture damage. And these are only a few of the countless reasons why you should choose an entry door from Window World. Contact Window World of Connecticut Today! We are proud of our in-home estimate service. One of our local representatives will come to your home and happily assist you with any questions about our doors or other services. The best part? It’s free, and there’s no obligation. What are you waiting for?